Summer is winding down, vacations are over and we are in the thick of school. 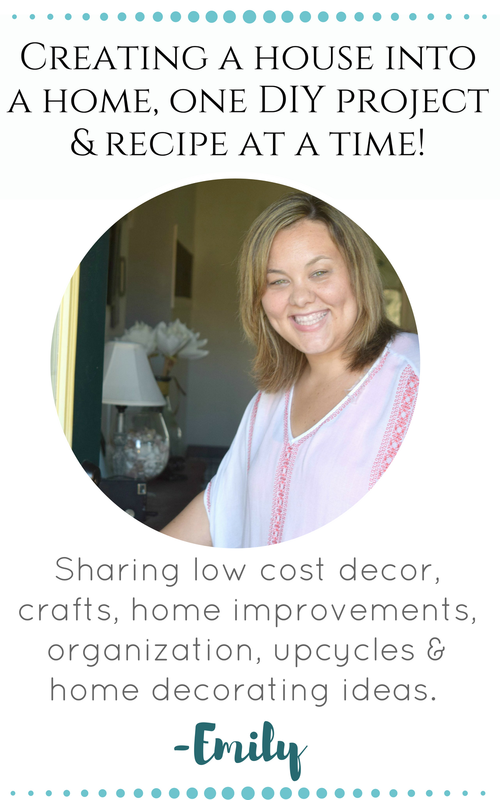 I am decorating my house this week for fall and crafting away for a few new decorations. With the end of summer in mind, it always has me reminiscing of our summer. Every year we make it a point to go to get away for a vacation. I am sharing my DIY coastal gallery wall, easy and low cost upcycle which is the perfect way to show off those precious vacation souvenirs. 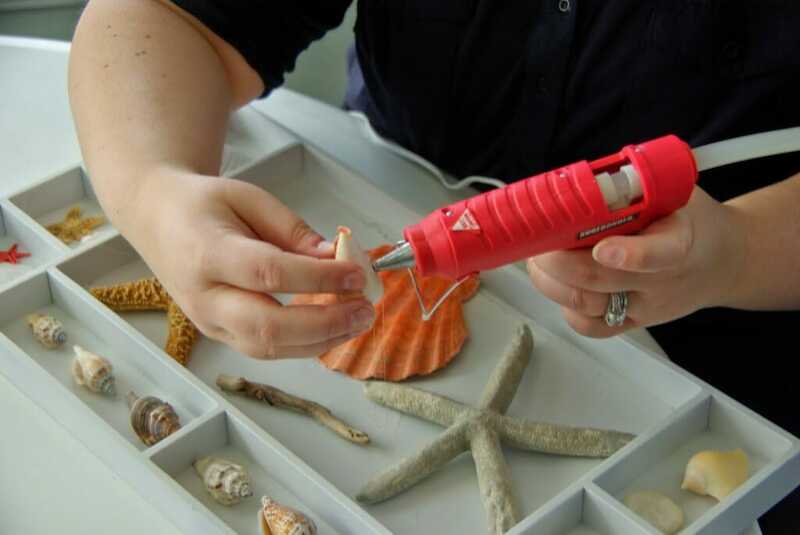 No more keeping them in a bx to be forgotten, let those vacation shells and finds be seen! I am sure you all have figured out by now I am a southern California girl at heart, who is stuck living in Wisconsin. I love my home, the town I live in, the family I have here, the life I have built. BUT… I miss California. I lived at the beach when not in school, spending way too much time in the sun, sand, and water. We go back every to visit family and friends and each time we accumulate shells. Either by picking them up on the beach, my Grandma giving me some she has been holding onto, or buying them from local stores. I have always just kept them nicely in a container with plans to one day do something with them. Well that day came, I somehow put two and two together. 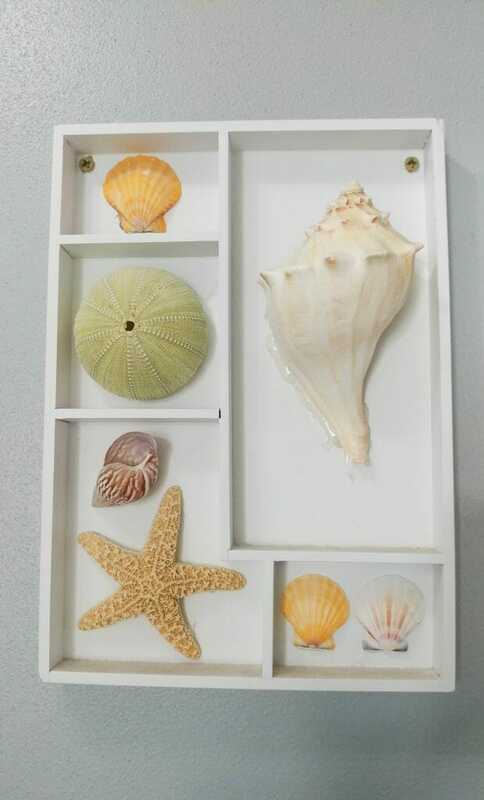 I have these great wooden containers, beautiful shells, and wall space. 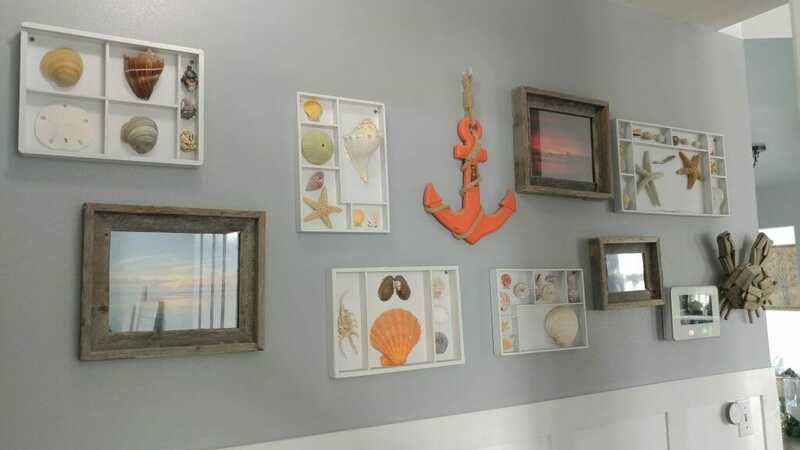 A perfect DIY coastal gallery wall, easy and low cost upcycle display in my home of my old stomping ground, or splashing ground in this case. 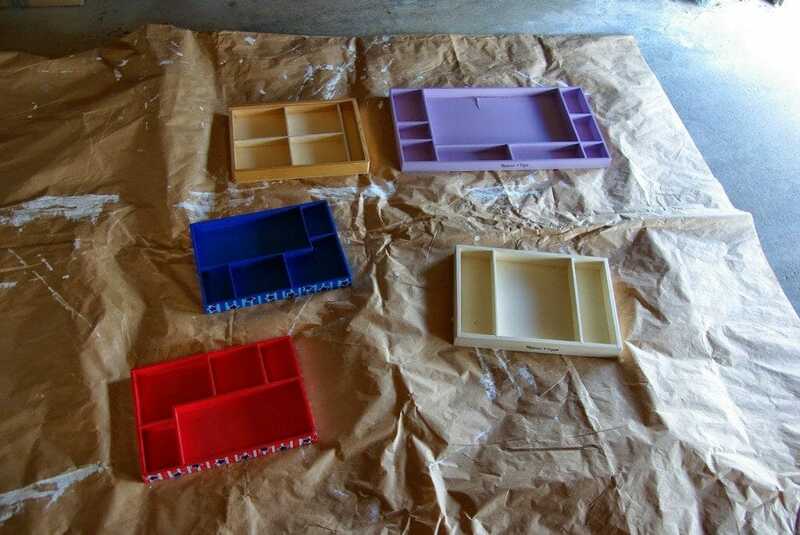 The first step was to gather all of the shells I had, see which ones I for sure wanted to display, and figure out roughly how many of these nifty wasted until now wood boxes I would need. These boxes I am using are my kids wooden toy containers. They are mostly Melissa & Doug toy containers. Once that was determined. I painted! Of course I painted. I just used a semi gloss white spray paint. I know really exciting. I set them on my trusty painting paper in the garage and went to work making these bad boys look more display worthy and less toy holder-ish. I ended up doing two coats of the spray paint. 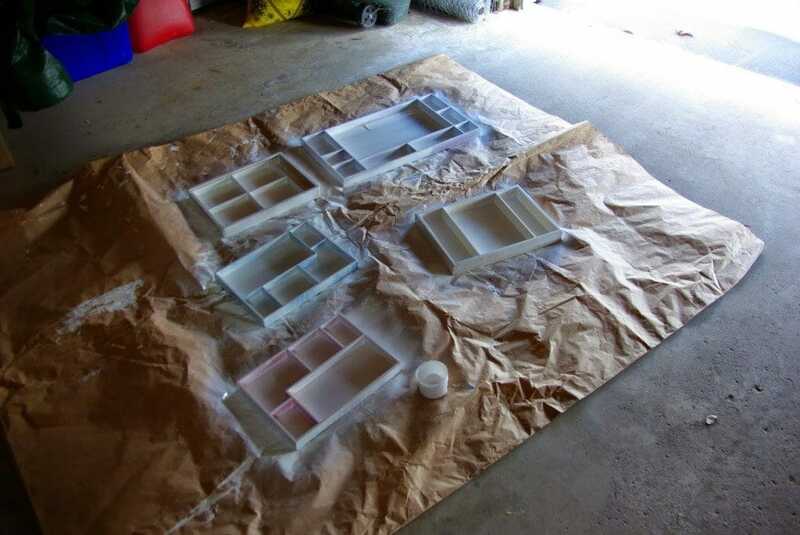 A easy spray painting tip- I always take my time with spray painting, doing light sprays across the whole surface. Keeping it moving the whole time. If you concentrate on one spot you get dripping no matter what. With those being done I started to think about the whole wall. I knew this would be going on the first wall in my hallway. It is visible from the living room, and only had some pictures of my kids that I put there because I did not want a blank wall. Well the position has been filled with better. My kids pictures will now be housed somewhere else. They will now have to deal with only 50 or so pictures in my home of them. I think we can spare to rearrange a few. 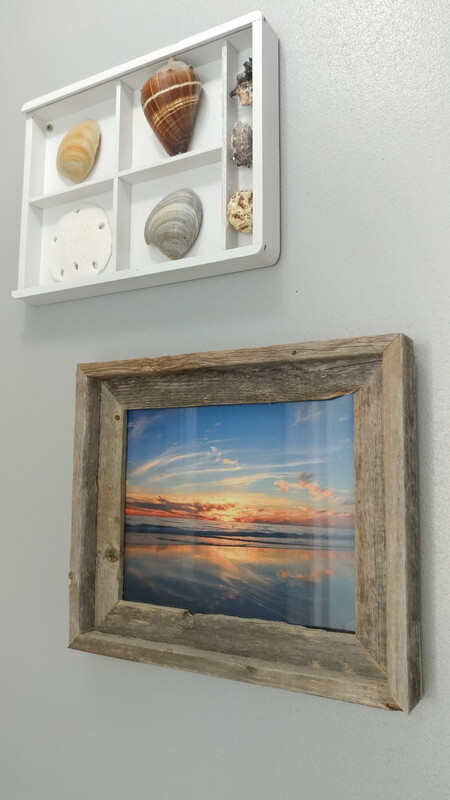 I ordered two 8×10’s and one 5×7, and found some great wooden frames that make it look like they are being displayed in pieces of wood found at the beach. I try to balance the coastal feel in my home with rustic pieces. Dale grew up in Wisconsin which is a beautiful setting full of barns and trees. 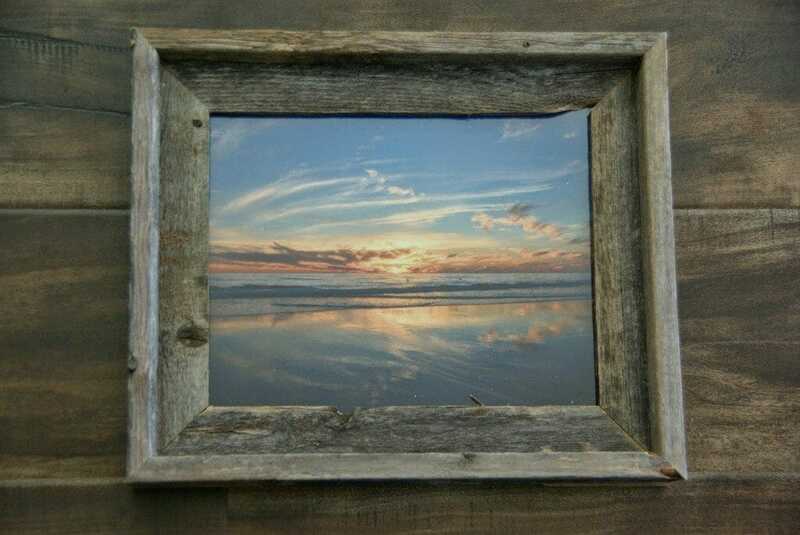 Using rough wood like this also warms up the natural cool tones of my coastal style. Once all of that was done I needed to decide how to display the shells and make them stay on the wall. I knew using a hot glue gun would do the trick but I felt guilty. These are beautiful pieces that come from the ocean and I am going to soil them by slathering hot glue all on them. I went around and around with a few ideas but nothing else worked, I finally relented and figured shells displayed and enjoyed with some glue is much better then them stuffed in some containers collecting dust. I set everything that would be on the wall on the floor. Measured the wall, used random markers (two chairs and my kitchen cabinets) as a visual for the size of the wall. I just started laying things down. Arranging and rearranging until things started to work. I knew the anchor was going to be in the middle, and one 8×10 picture on each side for symmetry but I did not want it to look too uniform. 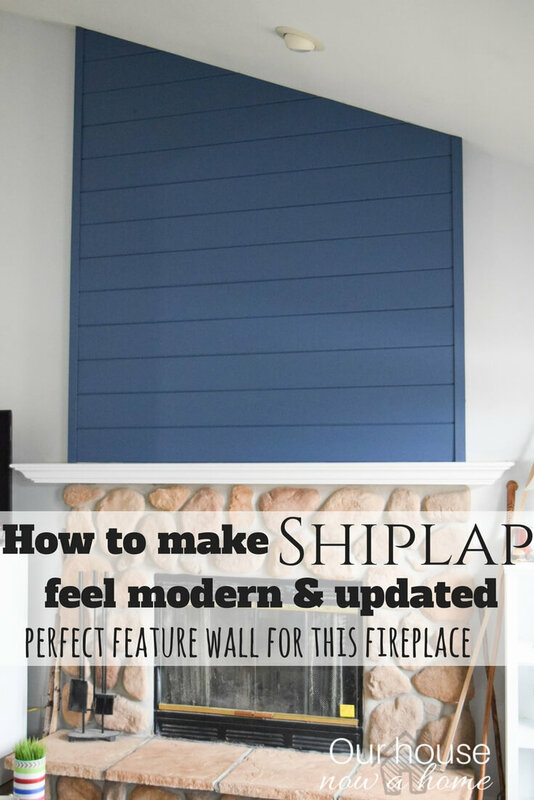 Most people get stuck when creating gallery walls because it seems overwhelming. 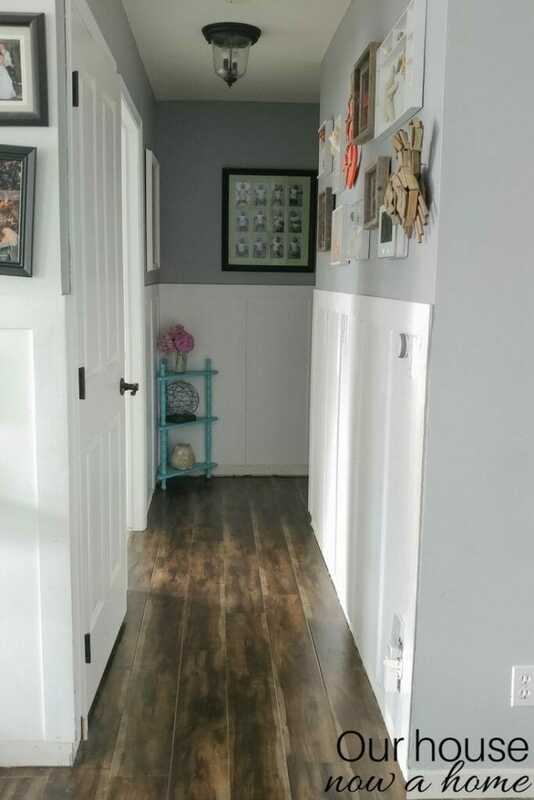 Measure out your space and start seeing what looks good. 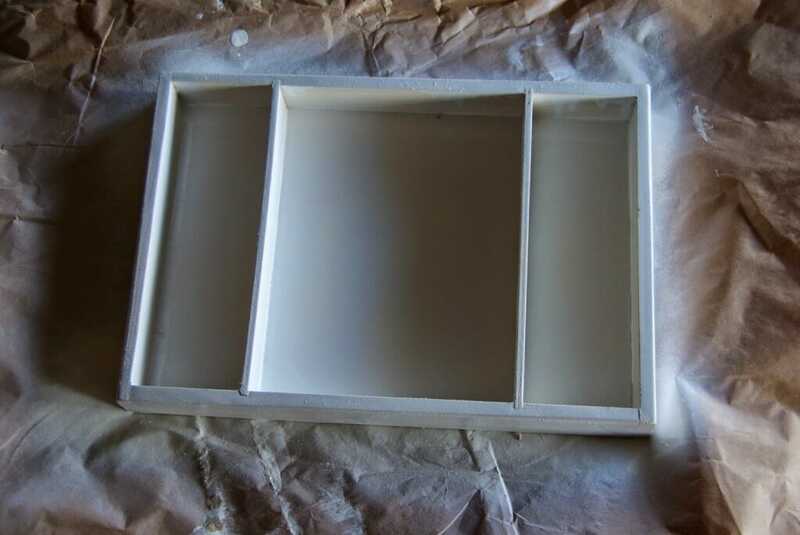 Adding or taking things away until you get the sweet spot of a personalized gallery wall. When I figured out the formation of all of that I placed the shells inside. 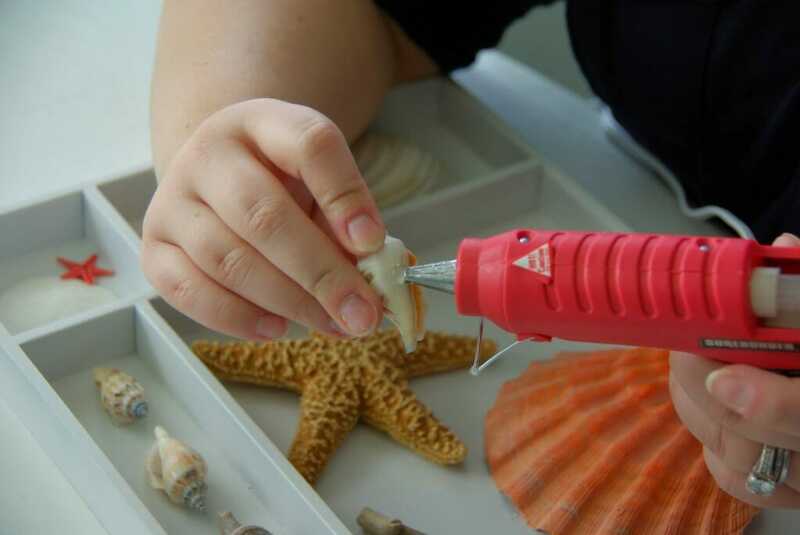 Being aware of not putting all of the colorful shells in one, or spreading out clam shells, crab shells, mussels, star fish, and sand dollars throughout all of them. I finally figured out the best balance I could manage. There is a ton of different ways to have a gallery wall, I tend to go for the perfectly imperfect. I do not like things too symmetrical, but there needs to be a good balance. Once I had it all set up I took a few pictures of this lay-out. This way as I am removing certain ones to hang on the wall, I can reference the pictures to keep the order in check. Next, the gluing. I used the low setting on the glue gun, I don’t think it could damage the shells on the high setting but I did not want to take the chance. Some of these are very special, either given to me from family or we picked them up ourselves. The hardest part with this was finding spots that the shells touched the surface of the display box. Some of them only had a thin piece of the shell touching it. I also did not want to put too much on. In case I ever do want to replace the shells with newer ones. But of course not too little where the shells fall out. You know that perfect balance in between that you have no way of knowing. Yeah, that is what was going on here. I also did a test after each display had all of the shells glued. First wiggling them myself, then lightly shaking, then picking up the display box holding it sideways, and then finally hanging upside down. I had not a one fall or move. Go me and my super hot glue gun powers. I tell you I am pro! Now to get them all on the wall. I started with the middle of the wall and worked my way out. I also consulted quite often the pictures I took of the display on the floor. Because I liked the look and location of the shells. There was a lot of running back and forth for the needed display, looking at pictures, and then telling my husband where to hang them. We connected the displays by using a standard screw in the top corners of each display. And that ladies and gentlemen is the whole project. 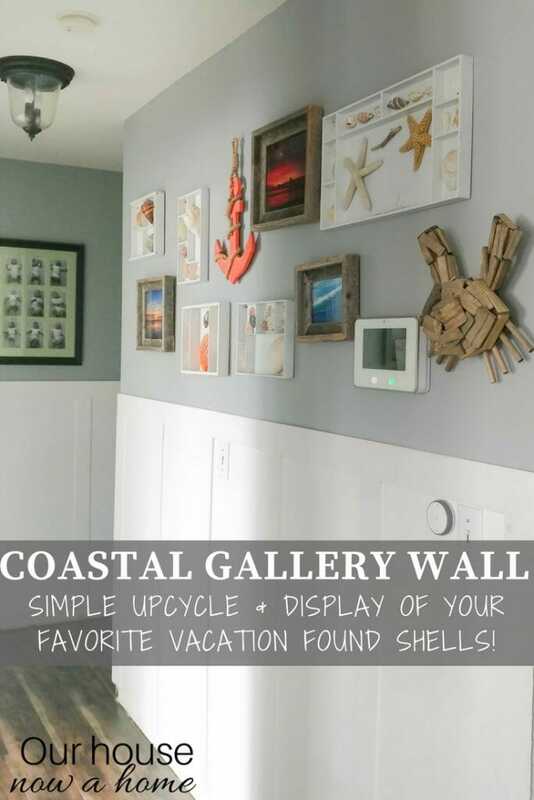 My DIY coastal gallery wall, easy and low cost upcycle turned out great, and I adore walking by it all the time. This is of course a special wall for me because it reflect where I am from, but also where my family has made memories as well. We spend time out in California every summer, playing and swimming on the same beaches I grew up in. So these sweet spots from my childhood have also become a part of my kids childhood as well. This same gallery wall could work for any vacation keepsakes. 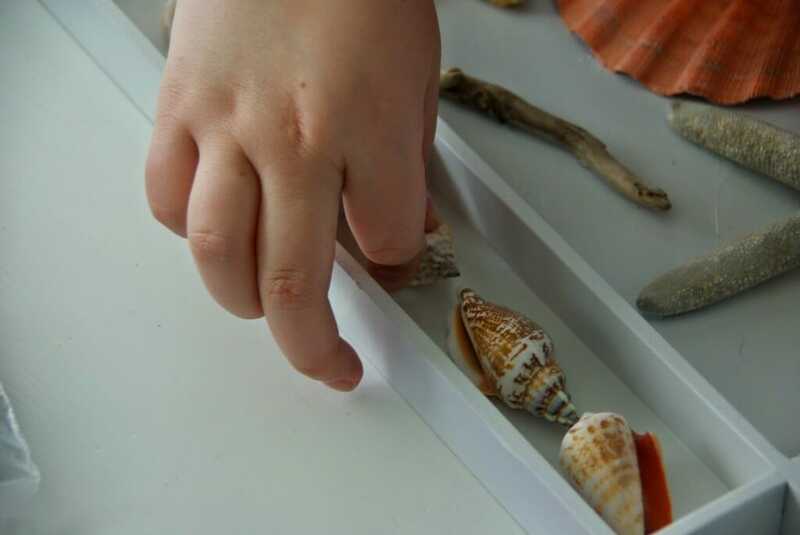 Shells, rocks, pictures, or tiny souvenirs put into the display boxes. It would be a really fun project to have the whole family get involved with. Picking the favorite pictures and momentous from a vacation. Life gets hectic and crazy this time of year, and the holidays are just around the corner… which is a whole other kind of crazy. Magical and wonderful, but crazy hectic. When we go on vacation it is our family’s time to take a big breath, have some fun, throw out the rules, phones, tablets and schedules. We get to enjoy each other and that is it. Having a place in our home to reflect on that blissful time is really special. 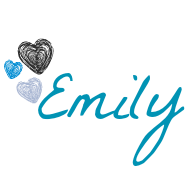 It also keeps me going in the throes of soccer games, baseball practice, running a forgotten viola to school…. seeing these pictures and shells reminds me what really matters. That would be the beach; kidding! It would be my family and the time we have together. Something like this can be easily added to as well. Adding more display boxes and pictures as the time goes on and more vacations are taken. I wanted to mention that I also had to work around our security system display screen. I treated that as a picture as well and just added the pictures around it. Maybe I should see if there is a display picture I can add of a beach, help it to blend in more? I am so excited for fall, I adore the changing of the season, the leaves, the cozy sweaters and the impending holidays. But my heart will always be in summer. There is something sweet, pure and wonderful of the lazy days of summer. Vacations are the most important part of the season! I love that this DIY coastal gallery wall, easy and low cost upcycle was so simple to make! 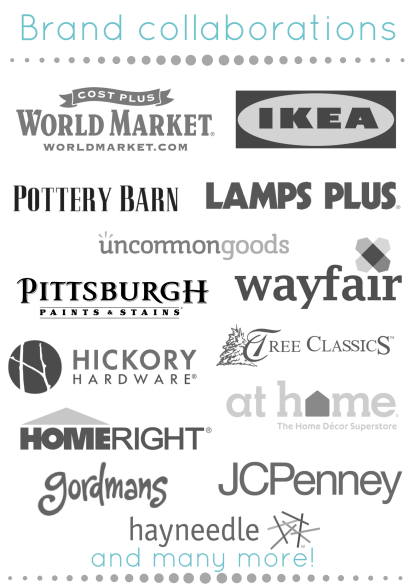 Honestly the most expensive part was probably the Melissa & DOug toys that we purchased for our kids ages ago. Because I am a hoarder and saw potential in these little wooden toy containers, I was able to create something wonderful for our home! Now, time to get back to getting my home fall-ified! I seriously need to go raid my kids rooms for toy containers. 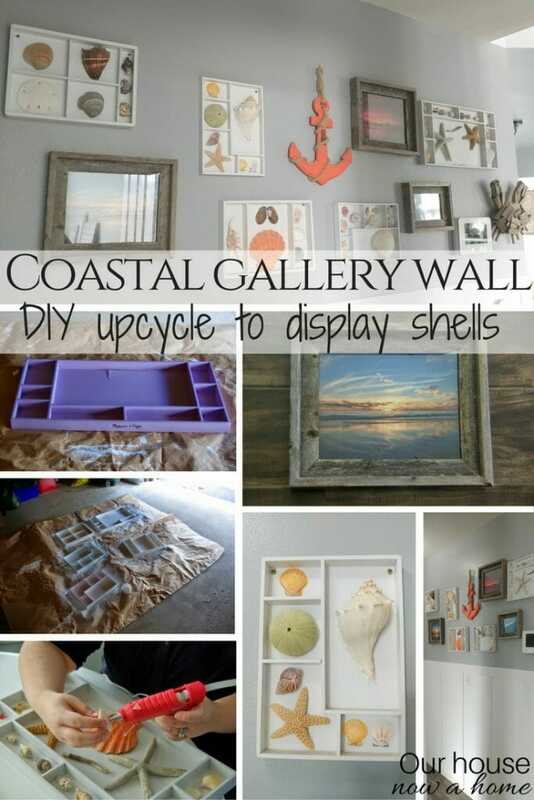 This is the best way to upcycle and make a gallery wall. I have an empty wall on our staircase that I’ve been wanting to spruce up. You did a fantastic job, with the coastal wall. 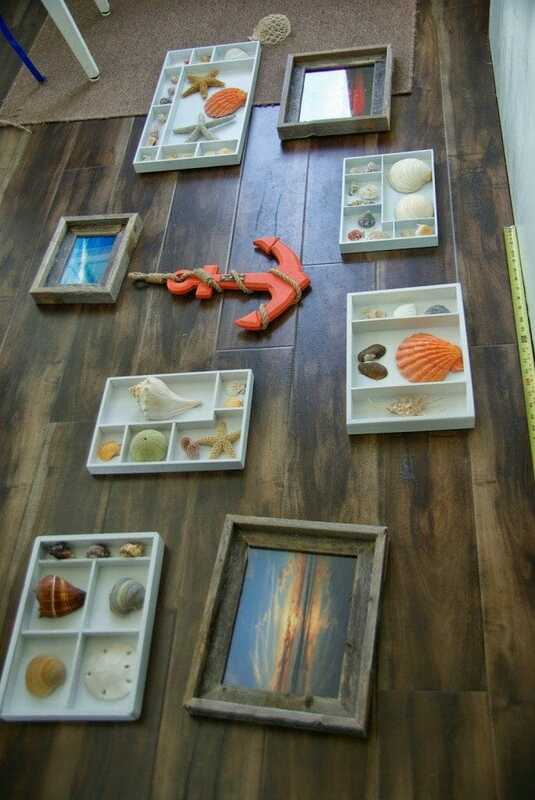 What a gorgeous idea for a coastal gallery, it really makes me think of a little home just beside the shore, perfect. I am a huge fan of this wall! It looks fantastic. You did a great job. You did a great job putting that all together. 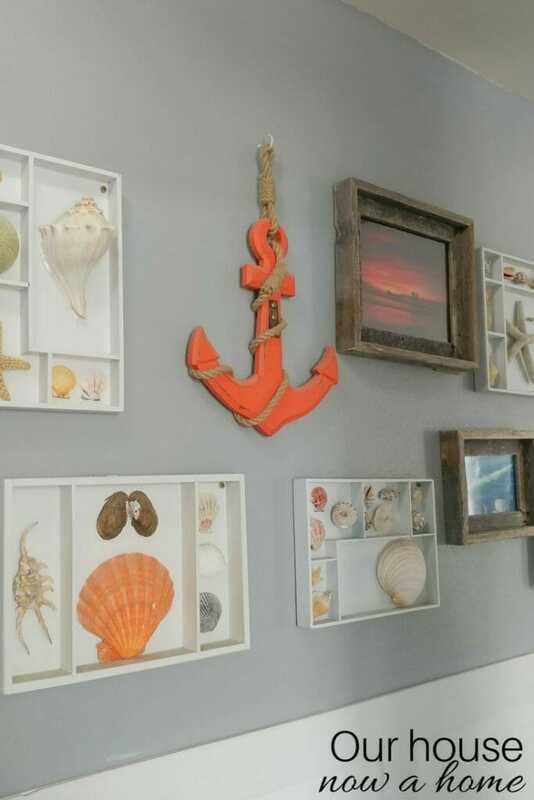 I live at the shore and this type of decor is very popular in our area, particularly for the summer homes. I love the colors…it’s like being in a coastal town. 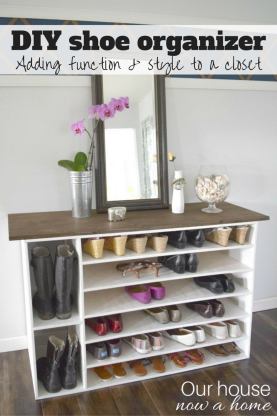 What a clever repurposing project! I love the result. I like the idea but would have to change it because coastal isn’t my thing. Would be easy enough to change it up into what we enjoy around our midwest. Now that is a great idea. Now I know what to do with all of the shells we’ve collected and purchased on vacations. The kids can help decide which ones to display. I absolutely love this wall. It looks like something I would see in my Better Homes and Gardens magazine! The colors are great, and I love that it was so DIY. We just returned from vacation and what a wonderful way to display some of the items we collected during our Summer adventures. This would be great for my friend’s parent’s beach house. I will have to share it with her, I love how it came together. WOW! It looks great! 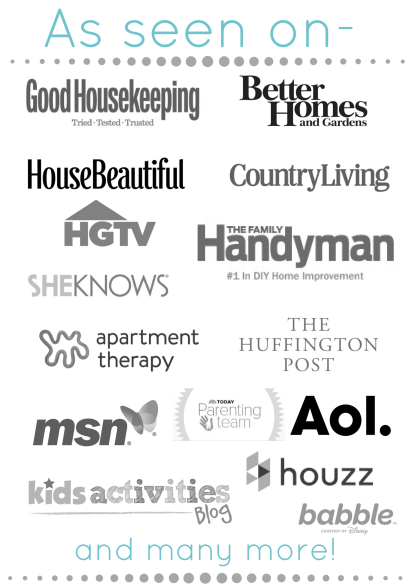 The color scheme of your home is very similar to mine. I have grey and white throughout too, with a lot of blues added in. 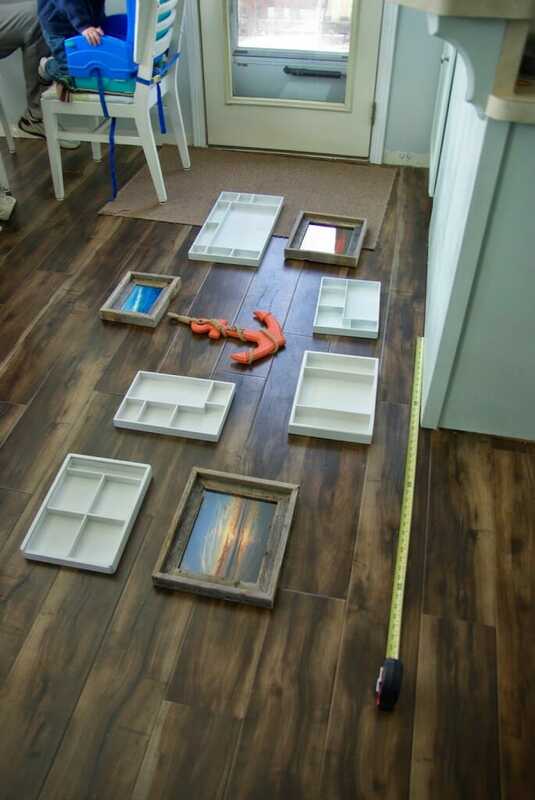 I love your coastal gallery idea. Thanks for sharing! I love your gallery wall! I love that it’s not just pictures, but also different objects. Great job! I love this! 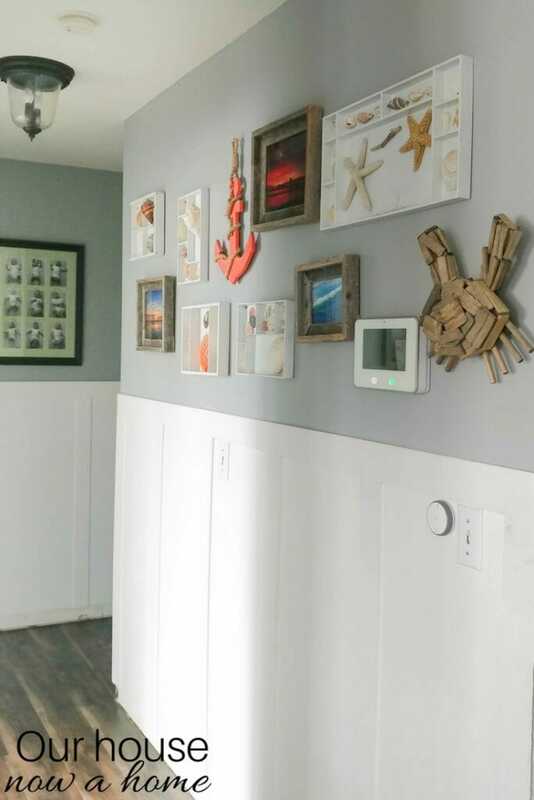 Usually our souvenirs get lost somewhere in my kids rooms, I love the idea of making a gallery with everything, yours looks super classy and you have a beautiful home! Oh wow, that looks amazing. I love the coastal vibe and I love how it looks summery even in fall. This is so inspirational! We had a great vacation and I bet I can put something like this together! Thanks! Wow. This is so gorgeous. I can’t believe you did it all yourself. I really need to get more into DIY. I love this! We’ve been collecting shells from all our trips this year and i wasn’t sure what to do with them. Now I know! I cannot wait to make some of these! What a great idea for a keepsake wall. I love the look of those photos frames. They look like beach wood. This turned out to be very beautiful! I would love to have something like that on one of my walls too. I don’t have much, but I have a few pretty seashells I have kept in a shoe box. I will ask my husband for help. I am sure he will be most willing to do this craft project. This is a beautiful gallery wall! 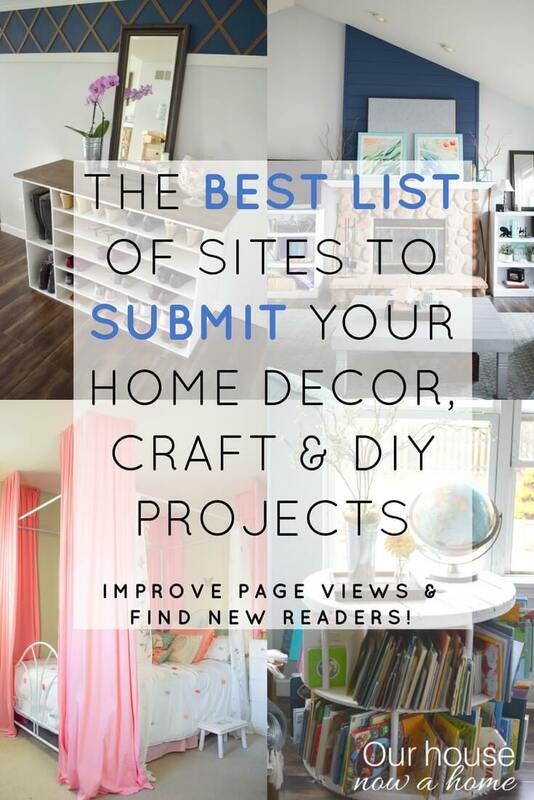 I love that I’m getting so many ideas for decoration and this is perfect. 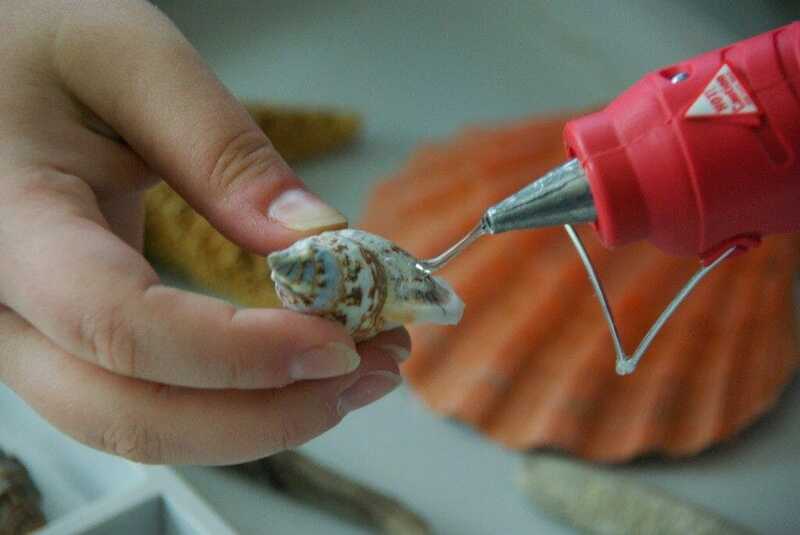 Seems like I need to grab a few seashells on my next trip! I love the color of the anchor! I like the coastal gallery. Such an innovative idea for decorating a wall. It looks beautiful. This is SO cute! There are so many cool elements here, but I think my favorite is the anchor. I just love the bright color! This is a wonderful way to bring the spirit of the sea and the coast alive into your house. I loved the look of the anchor motif. One of the things I love about your decor style are the ways your decorate your walls. 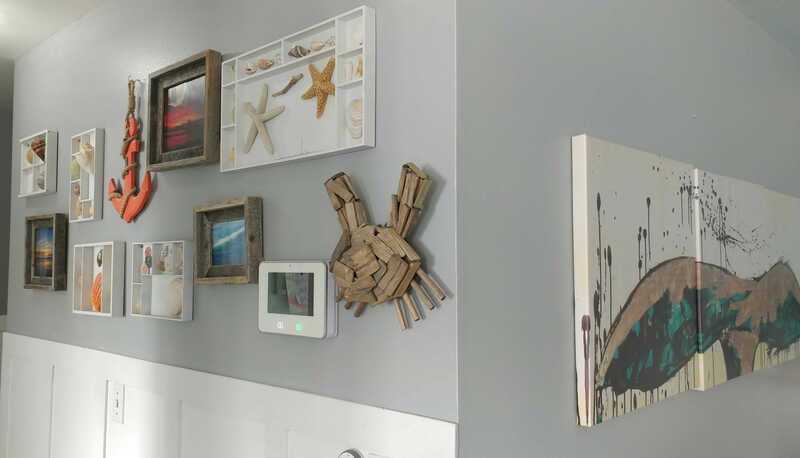 You always use nature inspired accents pieces and this coastal wall gallery is very stylish and well done. WOW! 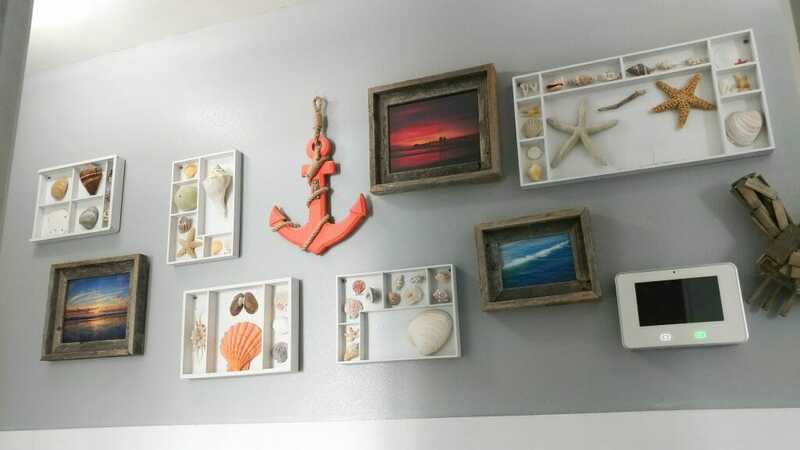 I love this coastal wall decor. I keep looking at the pictures and wonder if I could do something similar. 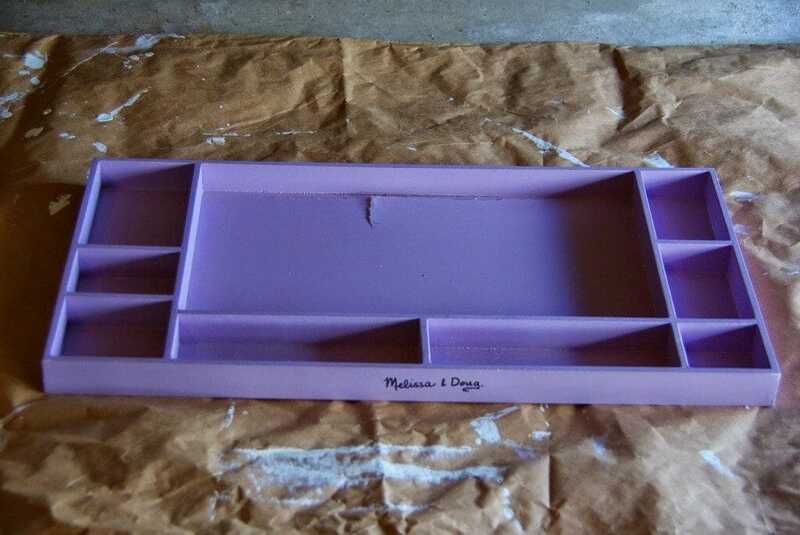 Maybe talk my husband into building some similar boxes for me. We spent one winter in Florida two years ago and I’m still “homesick” for the place!! So I understand what you are saying about loving the beach and enjoy the opportunity to return each summer. I can’t say enough nice things about your wall! Thanks for the inspiration and if I ever get anything done similar to this I will send a picture. We also love to visit Wisconsin! Beautiful in all seasons, and especially in the fall!